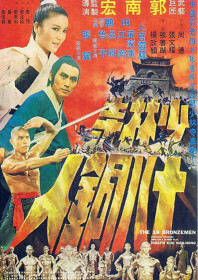 The formerly wooden guardians of Shaolin’s inner sanctum turn bronze (or, rather, bald men in gold body paint) in this modestly budgeted kung fu film from Joseph Kuo. It’s a great gimmick to disguise an otherwise routine period-set political pot-boiler. The image of the 18 bronzemen is now somewhat iconic (in geek terms), despite the fact the titular guards are criminally underused, given adequate airtime in the first half of the film only to disappear completely and never return. Once their guard is broken, skull-busting disciples Carter Wong and Yee Yuen leave the temple with vengeance in mind, hunting down the corrupt officials who killed their respective parents. The ideas in the first half of the film are quite refreshing, with the shining gold monks adding a campy sci-fi element to the superhuman spirituality of the Shaolin myth. Joseph Kuo would quickly capitalise on the bronzemen concept with a sequel, The Return of the 18 Bronzemen, released in the same year.